Do you remember the first time you went trick-or-treating dressed up in your favorite costume? Your first haunted house? Haloween might not be big in Greece but its one of my favorite times of the year, especially as I get to cook some of the most amazing, scary desserts ever, like this extra scary Halloween ghost cake recipe! So what is Halloween? Halloween is thought to have originated from the ancient Celtic festival of Samhain where people would wear costumes and wonder the streets to fight off ghosts. Forget about Poltergeist, this was properly scary stuff! A few centuries later Pope Gregory the Third designated November 1st as the day to honor Church’s saints and martyrs and that holiday incorporated some of the old Samhain customs. November 1st is known as All Hallow’s day and its eve on the 31st is was has come to be All Hallow’s Eve or later known as Halloween! So with trick or treaters getting ready to swamp the streets dressed up in their favorite costumes begging to be scared, tricked and of course treated start baking this awesome extra scary Halloween ghost cake recipe and properly scare their socks off! Forget about pumpkins, scary deserts, caramelised toffee apples, this is the real deal! Some sprinkle decorations – use your imagination! To prepare this extra scary Halloween ghost cake recipe, we are going to start by making our scary ghosts, which are nothing more than mini meringues. Preheat your oven to 110C(90C for fan). Using a hand mixer whisk the 5 egg whites in a clean bowl until they stiffen up and peaks form. Blend in the sugar a teaspoon at a time and carry on whisking until the mixture is thick and relatively solid. Cover a baking tray with baking sheet (grease proof paper). Pour your mixture in a freezer back to and cut out a small hole in the bottom corner and start squeezing a small circle of egg white pulling upwards to make a twirly ghost (yes, just like Gordon Ramsey does!). Make about 15/20 ghosts and bake for 1 and 1/2 hours until the meringues are nice a crisp. As this is a box standard sponge cake you can improvise with your own recipe and ingredients for your very own extra scary Halloween ghost cake recipe. Or simply follow our favorite! Mix the self raising floor, sugar and cocoa powder in a bowl and mix up to make sure no clumps can be seen. Mix the eggs, oil and milk in a bowl and pour in the flour mix. Stir until even and smooth. Grease a deep cake tin and pour in the cake mixture. Bake in pre-heated oven for 30 minutes. Once ready leave to cool and remove from tin. 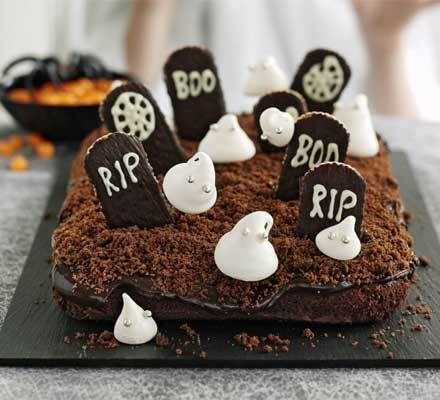 To make this scary Halloween cake recipe truly scary its time to make some tombstones! Heat up the cream in a saucepan until right before boiling, break up the chocolate and add one piece at a time and watch it melt! Stir till even. This will be the chocolate layer for our gravestones! Dip the tea biscuits in the mixture one at a time and set aside to cool. The rest of the mixture will be poured over the cake for a nice chocolate finish! To add an extra layer of crunchiness, blend the chocolate cookies in a hand blender or just smash them up with a rolling pin until small crumbs form – careful not to overdo it! Sprinkle on top of the hot chocolate covering the cake. If you are a master chef, try melting the white chockolate in a Bain-marie (bowl on top of boiling water), pour in a small freezer bag and once the mixture has slightly cooled down cut a tiny hole on the bottom corner and decorate the tombstones with scary words!